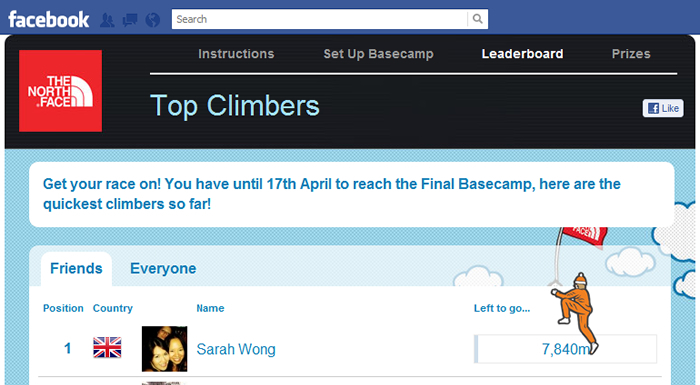 The North Face Basecamp App was the first application I developed that used Facebook Places as a gaming mechanism. The aim of the game was to reach the top of a virtual mountain by checking-in to places. User’s who check-in to North Face stores around the UK earn points that count as distance climbed. In addition, user’s were asked to create their own “Basecamp”, and get friends to check-in. Each friend check-in would earn the user more points. A friend could also tag other users in their check-ins (maximum of 5 people) to earn them extra points. The owner of the basecamp would also receive points for anyone that checks-in. There were restrictions put in place to prevent abuse of the check-in system. For example, the user could only check-in to the same North Face store once in a 24 hour period. This applied to friend check-ins too. A scheduled script (cron job) was used to calculate the points automatically at a fixed time every day. The application was first developed by a external developer, but was later bought in-house for me to develop in PHP and MySQL. I wrote the bulk of the application, including the check-in script for calculating points, Facebook integration, Leaderboard and the general page designs. Later, the app was given to a colleague to complete as I was put on another project. The application was used by thousands of users, and the first person to reach the top of the virtual mountain was given £1,000 worth of North Face goodies.